The ruler of Analog Planet (www.analogplanet.com) was having a particularly bad day when I arrived forty-five minutes late. A ground hum was eluding him and his digital sources, as they do to so many so often, had betrayed him. I didn’t want to see Michael Fremer flipping out over his stereo system (yea, it’s still called a stereo system though this part of his basement looks like an NSA hack center) but it was oddly re-assuring knowing this master audiophile cursed and fumbled with his own equipment like the rest of us. Kneeling on his basement floor trying to find the source of the rogue hum while on hold waiting for some far distant tech support to tech out his computer malfunctions. What was even odder was here I was, a rock n roller who had given up on vinyl and was still using a Technics SA-110 stereo receiver from ‘84 (my Fishers and Pioneers had done the dodo dance long ago) hanging with a dude whose turntable (a Continuum Caliburn) alone was ninety thousand dollars. “Well, I didn’t pay that much for it and I paid it off in 2007,” he adds with a calm smile, though he’s growing more and more impatient with that hum. Michael Fremer spends a lot of time in his basement and, 1) his wife is really cool about it and, 2) he doesn’t usually end up fighting his gear. From his chair situated perfectly between two Wilson Alexandria XLF speakers (I won’t even discuss prices here) he conducts his business as senior contributing editor to Stereophile Magazine and does his reviews for his own highly regarded website, Analog Planet. He listens to music as he passionately has for decades, on vinyl, the way it was meant to be heard. What you need to understand about Fremer is that he asks that question with genuine enthusiasm. Like an old college roommate, he can’t wait to play you his favorite or his newest album. Or maybe it’s your brother coming home with the latest Ramones. He reaches for a recent remaster of the Beach Boys Summer Party. “You’ve got to hear “Help Me Rhonda,” he exudes. And I do. Like for the first time, despite its seventeen million spins through my lifetime. “This is still the best pressing,” he ordains. Even with all the new remasters? “O they’re horrible. Even Geoff Emerick (the original studio engineer) said so. He absolutely hates them.” He checks his digital library so we can do some comparison listening but the system core says zero music exists. Will the new 180g and 200g vinyl discs snap, crackle, warp, and pop like the oldies? How does the new vinyl help us with breaking away from fossil fuels? What’s your electric bill like? “This is really making me crazy and I’m crazier than crap to begin with.” At this point there’s no analog or digital sound source. More French. Like I said, a bad day. “Let’s keep talking while I figure this out,” he instructs. I suspect my next question is hardly new to him. How does the regular guy get back in the game with all this high- end gear? The records are more expensive though. And I’m sitting in Abbey Road. George’s ever graceful, ever joyful guitar intro to “Here Comes the Sun.” The dynamic shift and wash of “Sun King.” I could sit here all day. I guess the best way for me to describe it would be presence. Like a pitcher has stuff, vinyl has presence. A presence I know many of us have forgotten. They can stat you to death with micro- byte measures, but it still comes down to presence and stuff. Presence and stuff. 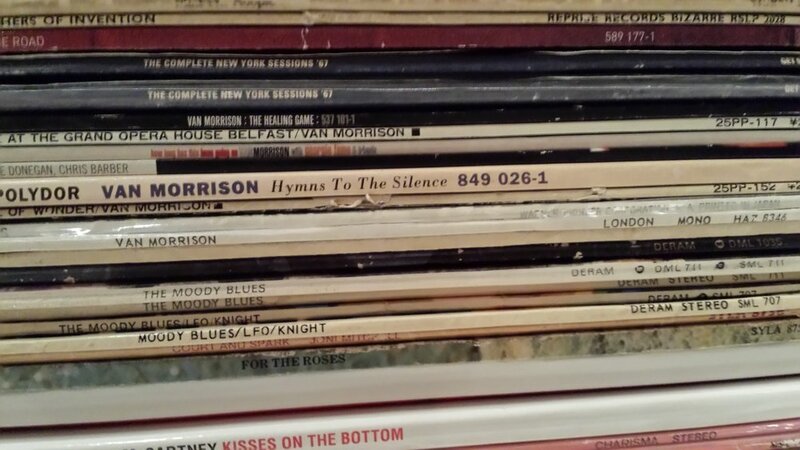 “You lent your records out to friends and left them lying around it stacks for days, right?” He says, pinning my old m.o. to the wall just as “Mean Mr. Mustard” crunches in. I pick up a crackle in the system. “Now what?” he exasperates. He goes to a small room off the main listening room, where his washing machine used to be, and comes out with a pair of thirty thousand dollar cables. “ Well luckily I don’t pay for cables. Now, let’s see if this works.” It doesn’t. How long will you sit here and review new equipment and records? In this realm you could say Fremer is the most opinionated guy on this, or any other analog or digital planet. Just check his blogs, podcasts, etc. But there was one review . . ..
We spend a good while deep in the weeds tech wise, but instead of me trying to explain it all (harmonic resolution, sound tamping based on helicopter rotor technology, magnesium alloys, 3D floating space, vacuum locks, designers with advanced degrees in physics and aeronautics, one who designed escape systems for the space shuttle, Kevlar straps, cog-less motors, airplane grade aluminum racks, 3D printable cartridges) I’ll just refer you again to Michael’s www.analogplanet.com. I wanted to spend more time talking about the back story. Talking tribally, like we used to about each others experiences while an original pressing of Kind of Blue filled the room. I ask to hear Brubeck’s Jazz Goes to College but he readily admits his copy is pretty beat. “How about Time Out? That’ll work. I must admit I’m listening to Michael but not really. I’m listening to the classic quartet - Trane, Jones, Tyner, Garrison - at peak form. And oddly I find myself comforted by the communal pleasure of listening with another person. Like we used to before all these mass communication devices isolated us. I must have been glazing over. “It’s incredible isn’t it?” he asks. I’ve been cynical too long to be honest. I’ve felt the whole return of vinyl was just another industry exploitation of the listener and the artist.